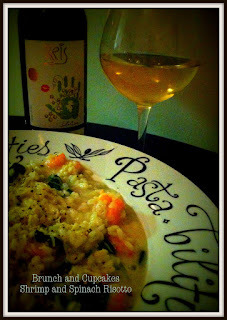 Risotto is a dish that kinda screams comfort food to me and is perhaps one of my favorite meals to make. Savory and full of flavor risotto is a dish that I never get sick of. Simple enough to make on a week night but still one of those dishes that is worthy of a special occasion dinner (Such as Valentine's Day). What I think is so great about risotto is the endless flavor options you have. 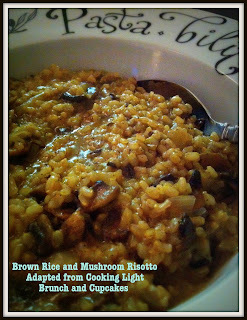 You can virtually add any meat or vegetable you like into risotto and 9 times out of 10 I am sure it will be delicious! I know that without a doubt any time a suggest risotto for dinner Derek is on board (my shrimp risotto is one of the dishes requested most often by him), so I knew the night I told him I was going to experiment with a brown rice mushroom risotto he would be game. The original recipe comes from Cooking Light and can be found here. I made a few adaptations to cater to the ingredients I had! Check it out! 1- Bring a pot of water to boil. Add rice and simmer for 15 min (rice will not be done). Drain and set aside. 2- Heat your chicken stock in a sauce pan on the stove and set aside for later. In a microwave safe bowl heat your 1 cup water and reserve for later. 3- Heat one tablespoon of oil in sauce pan. Add your mushrooms and saute for 8 minutes or until lightly browned. Remove mushrooms from sauce pan and set aside. 4- Add remaining 1 tablespoon oil to your sauce pan. Add shallots and saute until tender. 5-Add rice and cook for about 2 min. Add a little pepper. 6- Now stir in your wine and cook until evaporated. 7- Now add 1/2 cup chicken broth to rice mixture. Cook until absorbed. Stir in remaining chicken broth followed by your hot water 1/2 cup at a time. You will need to stir constantly - this process will take about 30 minutes. 8- Now stir in your mushrooms and parmigiano cheese and serve! ** I Served our risotto along side baked breaded chicken. The meal was delicious! I used to really love risotto but I did actually get super sick of it! maybe I just need to try some different flavour combinations. sounds like i need to eat more risotto! !